Words of caution are radical? Women carers are still fighting for the right to not be impoverished, overworked, isolated, or exploited in their work. Women face a dilemma. If we do the caring, men do not become carers with us but consumers of the care we provide. And if we refuse to care, those who need care suffer neglect and worse. [The recent] Global Women’s Strike’s international women’s conference in London made visible a growing women’s movement, of those who do most of this reproductive, caring work. Women do two thirds of the world’s work, and most of it is unwaged. The experiences shared with others from many parts of the world, including Canada, Greece, Haiti, India, Ireland, Palestine, Peru, Romania, New Zealand, Norway, Thailand and the US, included the ways they fight for the right to be carers, but at the same time not to be impoverished, overworked, isolated, exploited and even demeaned for doing this work. Our central demand is for a living wage for all workers, including mothers and other carers. Marxists may have incorporated into their thinking some of the considerations of the unwaged work of reproduction almost always done by women, but they have not often understood all the implications, and are weakest in appreciating the struggle over this work in a political, that is, an anti-capitalist way. In fact, the struggle by women – as mothers, as nurses, and other care workers – is based on challenging the uncaring market. We struggle against the market fetishism that governments ask us to worship: the idea that the uncaring market is central to survival. This is the exact opposite of the truth. Marx did not forget the crucial process: the production of labour power. In ‘Capital Volume One’ he described “the production and reproduction of that means of production so indispensible to the capitalist: the labourer himself”. But he didn’t know so early in industrial capitalism’s history that capitalism would not always be able to take the reproduction of labour power for granted. One reason he didn’t see this reproductive work as part of the struggle was that so little of it was being done when the whole family was in the factory working 12 or 14 hours a day from an early age. That is why working class life expectancy was so tragically short in 19th century England. At the time, there was not yet a powerful women’s movement, which could for example, organise a Birth Strike, as happened in the early 20th century. The invisibility of women’s care hides the impact on the whole society when women are driven out to work with the ethos that stacking shelves in a supermarket is work but that those caring for the new-born are (in Tony Blair’s word) “workless”. But why should waged work for capital by anyone be the priority, especially for those of us who are anti-capitalist? It is at this moment, when millions of women in industrial countries are exhausted by the double day and many more millions of subsistence farmers find it even harder with climate change to feed their families, that payment for caring work is forcing its way onto the agenda. Justice work is an even more hidden extension of caring work. ‘Mothers, daughters, sisters, wives fighting for our loved ones’ lives’ reads the slogan, held on banners at protests against deaths in custody, stop-and-search, detention and deportation of immigrants and refugees. Women everywhere are doing justice work against every discrimination and in situations of occupation and war. We cannot avoid addressing the growing split in feminism. The 13 per cent of women for whom the movement is primarily a career ladder for their ambition have defined anti-sexism as their struggle to rise in the class hierarchy. And when they do rise, little or nothing changes for those of us who are left at the bottom. Our conference heard about new important research on the “golden skirts”, in the professions, the boardrooms and government. As with every movement, some from the sectors the movement form to liberate have risen. But all this means is that the well paid ruling stratum is slightly more diverse. Recent figures show that boardrooms in top FTSE companies have 26 per cent women. A recent report is pressing for 30 per cent in the next 10 years. This is liberation for the few and sexism (and racism) for the many. Carers of the world unite, you have nothing to lose. You have a living wage and a caring world to win. 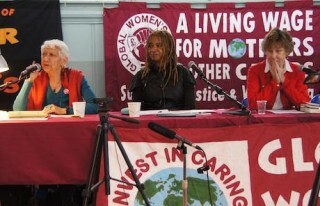 Selma James is founder of the International Wages for Housework Campaign and the co-ordinator of Global Women’s Strike. A version of this article appeared in OpenDemocracy on 17 November 2015.